I’m back with another kitchen hack. This time I wanted to share my little trick for rolling pastry or biscuit dough without getting flour all over kitchen. Before I had worked out this hack, I used to avoid making pastry because of the mess. Flour would always manage to be spread all over the kitchen and, quite frankly, it would drive me crazy. These days, pastry is something that I find easy to make (thanks to my food processor), and easy to roll. Best of all it takes very little time. So here is my hack; instead of sprinkling flour all over the bench, place your pastry disk onto a sheet of baking paper. If you need to roll a large round of pastry, use two pieces overlapped slightly. Place another sheet (or two) of baking paper on top of the pastry. 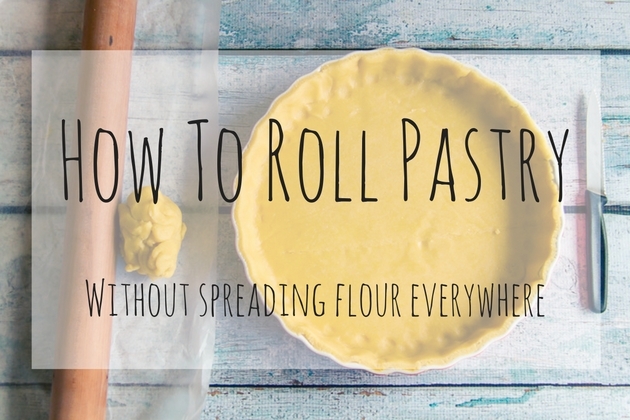 Use your rolling pin to begin rolling the pastry. After each brief roll, turn the paper and pastry ninety degrees (quarter of a circle) and continue rolling. This will help the pastry to remain evenly round and of an even thickness. Continue rolling in this way until your pastry is the desired thickness. Peel the top sheet(s) of paper off the pastry. Carefully roll the pastry onto the rolling pin, and then unroll it on to pie plate with the remaining paper facing up. Ease the pastry into the pie plate, and peel off the baking paper. Sound confusing?? It’s actually pretty simple. Here is a video I made to explain the process more easily. A few tips to help you along. To get pastry that is lovely and short (crumbly) when you bake it, use a food processor to mix it up. I would never, ever bother making pastry by hand now that we have a food processor. Make sure your pastry or biscuit dough is moist, or ever so slightly sticky. Dry pastry falls apart so easily, and is very hard to handle. If you make your pastry in the food processor, it won’t go tough when you add moisture. Make sure you rest your dough well in the fridge before rolling. I tend to let it rest for 30 minutes in the fridge and then pull it out for 5 minutes before I roll it. Cold dough is a lot harder to roll than just slightly cool dough. How moist your dough is will depend on the weather. If the humidity is high, it will be stickier, and may need a little more flour. If it is very cool or dry, you may need to add a little more moisture – use a teaspoon of water at a time. If you find your baking paper bunches up during rolling, peel it off the pastry, place it back on the top nice and flat, and continue rolling. Once I have the pastry in the pie plate, I use my fingers to manipulate and press the pastry right into the corner of the plate before I cut the extra pastry off. Once you’ve rolled and cut your pastry in the pie plate, leave it to sit for 15 minutes before baking. This will allow the pastry to relax and reduce the likelihood of the pastry shrinking in the oven. Place the flour, sugar, salt, and butter in a food processor and process until the mixture resembles bread crumbs. Add in the egg and egg yolk and process again until the mixture comes together to form a dough. Roll and cut to the desired size and shape. I use this method for my passionfruit curd tartlets, my chocolate sour cherry tart, and my stonefruit galette, as well as for biscuits, and even pizza dough. Got any other pastry tricks to share? Want to know another kitchen hack? This is great! Thank you. I love to make everything from scratch, and now that I have little ones (1&3 year old) anything that helps along in the kitchen is much appreciated. 🙂 Definitely saving for Thanksgiving! My youngest son used to say that my meat pies were 9/10. His grandmother’s on the other hand were 12/10. Why? Her meat simmered for hours on the side of the fuel stove which they had in addition to gas. The main reason was that she always made her own pastry.